NOTE: Knife is not included. 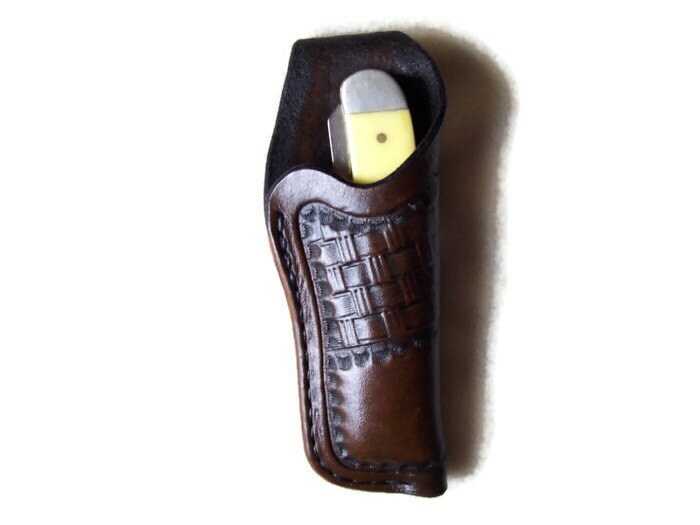 Medium Custom leather knife sheath with belt loop. Features a hand tooled half basket weave design in Chocolate Brown, Saddle Tan, Black, Mahogany, or Natural leather. A color chart can be found by scrolling through the photo's. Fits most knives measuring: 3 1/2" to 4 " Long X 1 1/8" W X 1/2" thick OR 1" W x 5/8" Thick. If you feel this sheath will be slightly too large for your knife, check out the listing for my "medium-small" sheath. Sheath is custom designed and hand tooled on premium carving leather with a folded and hand stitched 1 1/2" belt loop,hand rubbed finished edges, and recessed hand stitching. Stitching is guaranteed for the life of the item. Works well with Buck 389, Case Sea Horse Whittler, Case Sod Buster Jr., Small Trappers,Case Canoe, and reg Swiss Army Tinker,Spartan, and Pioneer like knives. This item is made as ordered and ships in approx 7-14 business days. Quality built in the USA! Flawless fit and finish, very high quality. Would highly recommend to others. Top notch customer service as well. This sheath is beautifully made and a pleasure to use. The craftsmanship and materials are both first rate. I use this pocket sheath with both my Victorinox Climber and Spartan knives and I am very pleased with the protection it provides them. Note! I’ve tried a few times to add a nice photo of this sheath but the Etsy “Add a photo” function doesn’t work. The photo doesn’t upload. Etsy, please fix it! Perfect in every way. Superb craftsmanship. Exact fit. Thank you very much.